Born on the streets and born singing, Tony Pagoda has had his day. But what a day it was!He had fame, money, women, and talent. He spent his golden years entertaining a flourishing and garishly happy Italy. His success stretched over borders and across the seas. But somewhere things began to go awry, the public's tastes in music first and foremost. His band is now a shadow of its former self and his life is fraught with mundane but infuriating complications. It's time to make a clean break with the past. Following a brief tour in Brazil, Tony decides to decamp and make a life for himself in South America. Here, his hyper- developed and very peculiar vision of the world, irreversibly shaped by those years in which he hobnobbed with Sinatra and enjoyed the adoration of audiences the world over, is under assault. Now that he has abandoned music the world strikes him as a barren place that is completely at odds with his understanding of it. Tony's story is the story of a worldwizened but yet strangely naive man forced to reconcile with life or lose himself entirely. 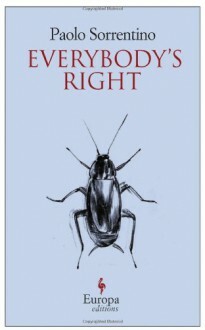 Told in a breathless, irreverent first person voice that is as original as any in contemporary literature, Everybody's Right is the debut novel from one of Italy's most compelling and singular creative minds. Paolo Sorrentino, known principally as the director of movies considered to be among the finest examples of cinematic art by any Italian filmmaker in recent decades, here proves himself to be an equally formidable novelist.